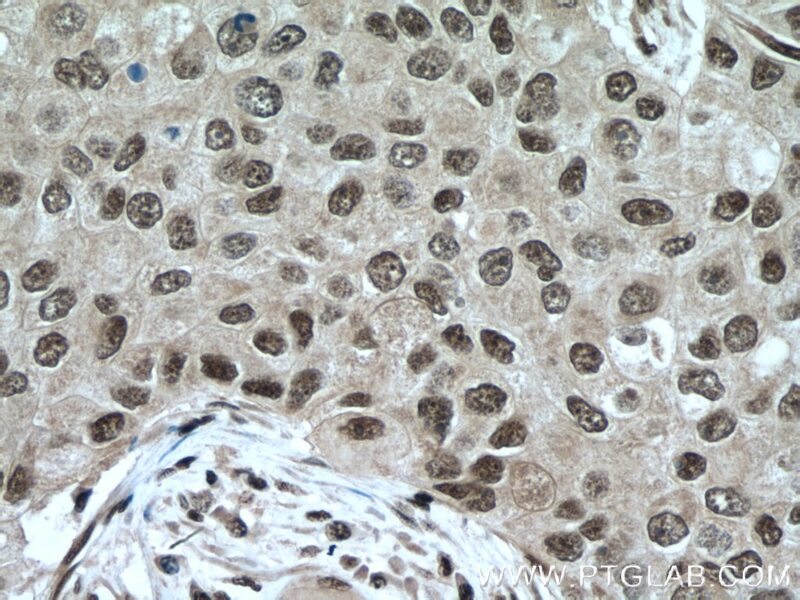 Immunohistochemical analysis of paraffin-embedded human breast cancer tissue slide using 22156-1-AP( YY1 antibody) at dilution of 1:200 (under 40x lens) heat mediated antigen retrieved with Tris-EDTA buffer(pH9). A549 cells (shcontrol and shRNA of YY1) were subjected to SDS PAGE followed by western blot with 22156-1-AP ( YY1 antibody) at dilution of 1:1000. IP Result of anti-YY1 (IP:22156-1-AP, 5ug; Detection:22156-1-AP 1:700) with HeLa cells lysate 880ug. YY1, also named as DELTA, INO80S and NF-E1, contains four C2H2-type zinc fingers and belongs to the YY transcription factor family. YY1 is a multifunctional transcription factor that exhibits positive and negative control on a large number of cellular and viral genes by binding to sites overlapping the transcription start site. YY1 may direct histone deacetylases and histone acetyltransferases to a promoter in order to activate or repress the promoter, thus implicating histone modification in the YY1. The open reading frame of the human YY1 cDNA encodes a protein of 414 amino acids with a predicted molecular weight of 44 kDa. 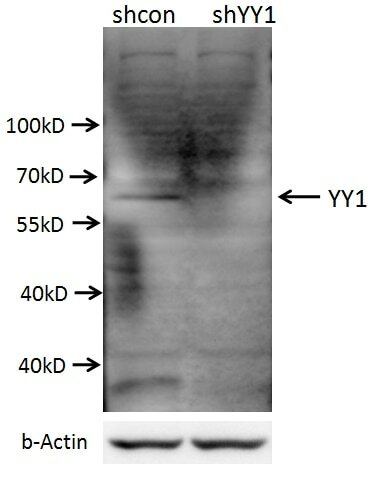 However, YY1 migrates on SDS gels as a 65–68 kDa protein, probably due to the structure of the protein. It is a ubiquitously expressed transcription factor with fundamental roles in embryogenesis, differentiation, replication and proliferation. 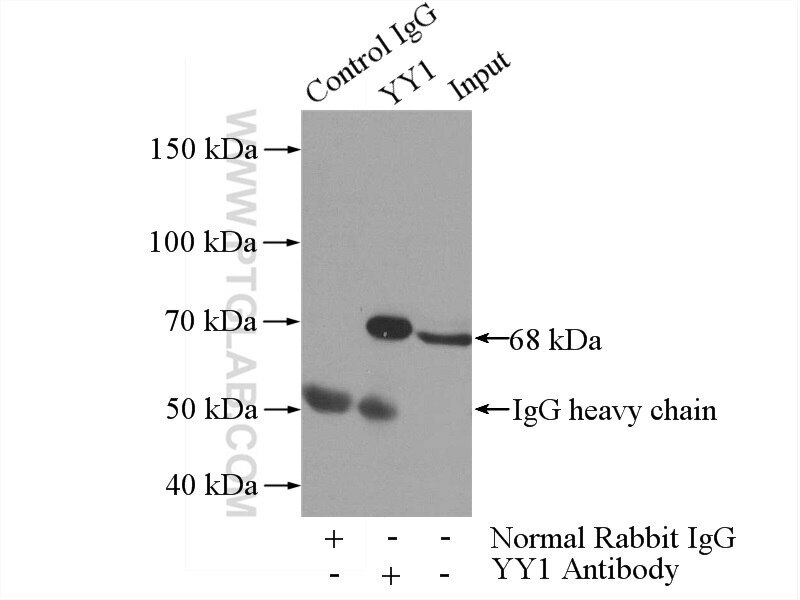 This is a rabbit polyclonal antibody raised against full length YY1 of human origin. Upregulation of miR-146a by YY1 depletion correlates with delayed progression of prostate cancer. YY1-regulated LINC00152 promotes triple negative breast cancer progression by affecting on stability of PTEN protein. Interleukin-18 Down-Regulates Multidrug Resistance-Associated Protein 2 Expression through Farnesoid X Receptor Associated with Nuclear Factor Kappa B and Yin Yang 1 in Human Hepatoma HepG2 Cells. 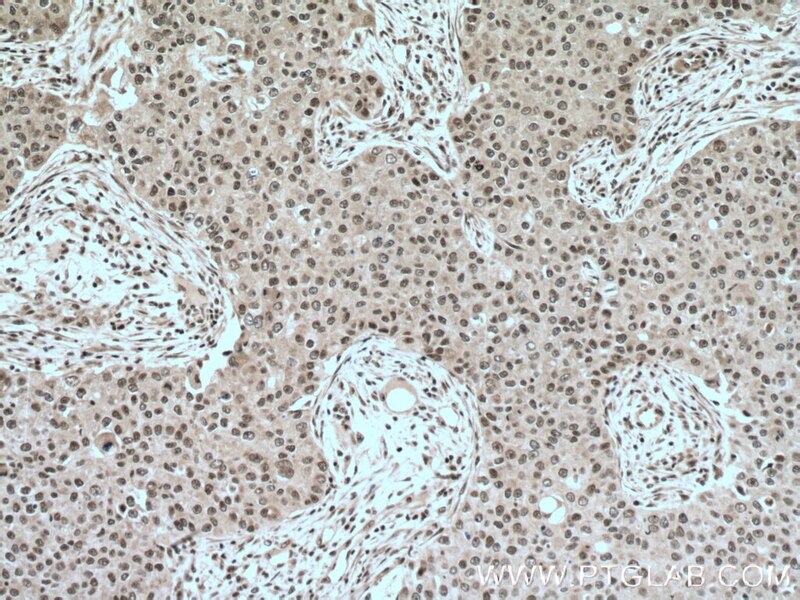 Immunohistochemical analysis of paraffin-embedded human breast cancer tissue slide using 22156-1-AP( YY1 antibody) at dilution of 1:200 (under 10x lens) heat mediated antigen retrieved with Tris-EDTA buffer(pH9).